hyper allows its users to manage the projects of the organization. This tab is used for creating new projects, manage and follow each of the organization's projects. Main - The authorization to view this project. Additional Contacts - The contact persons for this project. Relationship - The meetings, phone calls, Email messages, Service Tickets and Audio Recordings of this project. Documents - The files and documents of the project. 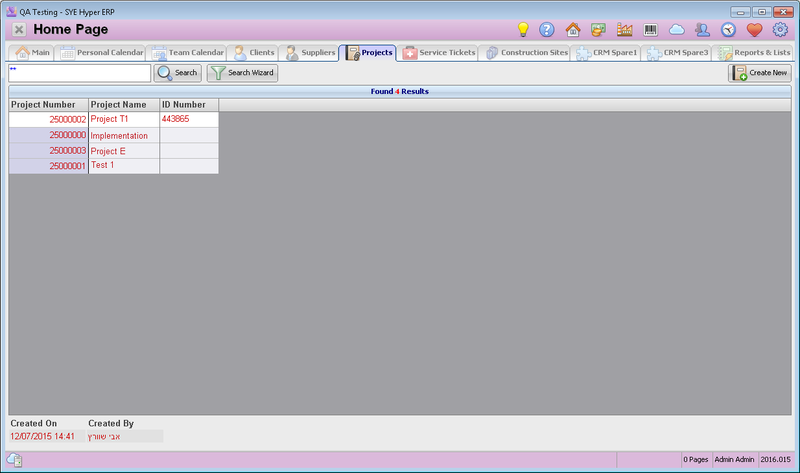 Modification log - The list of modification made in the project card. The searching field at the top of this tab allows to search for existing projects of the organization. Fill in the Project Name / Number / ID and press the Search button, to display its card. Filling in a partial Project Name / ID Number , will display all of the projects cards that contain this content in one of these fields. Alternatively, the system allows to use the Search Wizard button, in order to search for a project by using customized filters, according to the users needs and the organizations requirements. This wizard allows to create permanent filters, that will be available to any user according to authorizations. The table in this window displays the searching results. This table displays all of the projects cards that contain the required identifying details. Each row represents a different project card as well as its details (The displayed fields can be customized by the user). The user can choose to display additional or different information fields and define the Fields Layout and Rules, according to the needs and the requirements. Main - At the top of this tab, define the Project Name, its ID Number and the default currency for the formal documents. Additional fields can be added according to the user preferences. This tab also allows to define the authorizations for this project. Additional Contacts - The contact persons of this project.